When University of Virginia rowing coach Kevin Sauer learned that Meghan O’Leary was leaving the school’s volleyball team, it seemed to him a perfect time to propose another athletic endeavor to her. O’Leary, who had enrolled at UVA in 2003, stood 6 feet tall and in high school had starred in volleyball, softball and basketball. “So I said, ‘Meghan, why don’t you row? You’d be great at rowing,’” Sauer recalled recently at the Cavaliers’ boathouse at the Rivanna Reservoir. O’Leary demurred. She’d never picked up an oar. Alas, Sauer’s enthusiasm was not reciprocated. O’Leary joined Virginia’s softball team in 2005 and ended up earning four letters in that sport, the fourth as a graduate student. O’Leary, a Jefferson Scholar, graduated from UVA in 2007 with a bachelor’s degree in sociology and religious studies. In 2008, she received a Master of Education degree in social foundations and policy from the University. Two years later, after taking a rowing lesson in Hartford, Connecticut, and falling in love with the sport, O’Leary telephoned Sauer. “This” can only be described as a highly unusual sequence of events. In August, some six years after picking up an oar for the first time, O’Leary will row for the United States at the Olympic Games in Rio de Janeiro, Brazil. 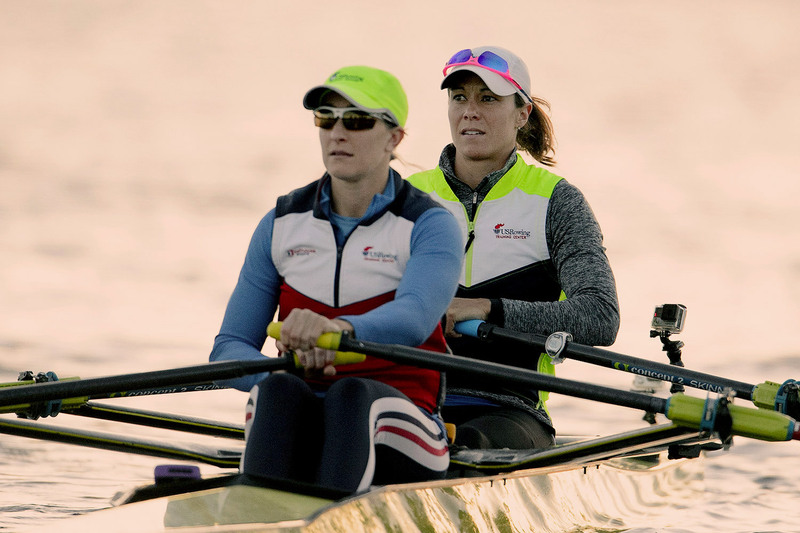 Coaching her in Rio will be Sauer, whose support over the years has accelerated O’Leary’s development as a rower. O’Leary, 31, and teammate Ellen Tomek qualified for Rio by finishing first in the women’s double sculls event in late April at the U.S. Olympic Trials in Sarasota, Florida. O’Leary and Tomek were in Charlottesville training recently with Sauer, along with their full-time coach, Sarah Trowbridge. Trowbridge is pregnant, and with the baby due this summer, O’Leary and Tomek had to look for a temporary replacement. Sauer was a natural candidate. O’Leary, a graduate of Episcopal High School in Baton Rouge, Louisiana, knew nothing about rowing when she arrived at UVA. As chance would have it, though, her first-year roommate was a rower, Anna Samaha, who would later be a team captain for Sauer. After earning her master’s in 2008, O’Leary worked for ESPN in Connecticut for nearly five years before leaving to pursue her Olympic dream. Her job as an ESPNU programming coordinator brought her back to Charlottesville periodically to cover UVA soccer and lacrosse games. She’s based this summer in Princeton, N.J., home of U.S. Rowing’s training center. During the winter months, she trains in the San Diego area. Wherever O’Leary may be, she still roots for the ’Hoos. UVA’s coaching staffs have turned over several times in softball and volleyball since O’Leary’s college days, “but I love following the programs, and if you were a part of the program, you feel invested in wanting to see them succeed,” she said. During her five years at UVA, O’Leary stayed exceptionally busy. Among other activities, she was a two-time intramural champion in basketball, wrote for the Cavalier Daily, organized a fund-raising event for Hurricane Katrina relief, served as a Student Athlete Mentor and on the SAM Council, hosted the UVA-produced Cavalier Sports Weekly television show four times, and served as the volleyball team’s public-address announcer in 2006. She also was a Fourth-Year Trustee. O’Leary remembers writing down her goals as a second-grader. One was to become an Olympian. Later, when she was working for ESPN, that goal seemed unattainable, “and that was OK,” O’Leary said.